At the time of Noah, the earth had became so corrupted and filled with violence. People would rob and kill. But Noah is a just and righteous man before God. God was so sad that the earth is filled with violence. He got so upset that he decided to kill everyone that has the breath of life by flooding the whole world with rain. But God remembered Noah because Noah is a good man. Noah listened to God and obeyed his command and he built a big ark. When the flood arrived on that day, Noah and his wife, his sons, and his sons’ wives along with a pair of each kind of animal went into the ark. God rained on the earth for 40 days and 40 nights. The flood waters destroyed everything that breathes. After 40 days of raining, God decided to stop the rain. God made a wind to pass through so that the water will resided. The waters started to go down and the ark came to rest on the mountain of Ararat. At the end of the 40 days, Noah gets an idea to send out a raven to see if the land is dry so that they can come out safely. The raven kept on flying to and fro until the water is dry up completely. The raven didn’t come back so Noah sent out a dove this time. The dove flew out from the ark and never finds any tree where it could land on so it returns to Noah. So Noah decided to wait for 7 more days, before he send out the dove again. This time, the dove came back to Noah with a plucked olive leaf in its beak. 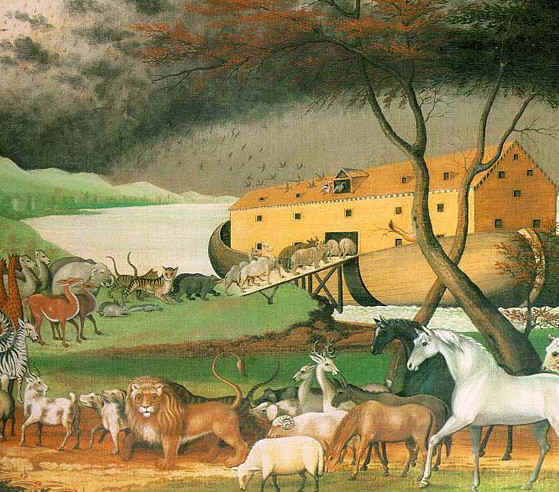 Noah knew that the earth had dried up and he and his family and the animals all went out from the ark. After the flood, God promised that he will never again destroy humanity through a flood. God marked His promise by putting a rainbow in the sky. That is why you see rainbow after rain.